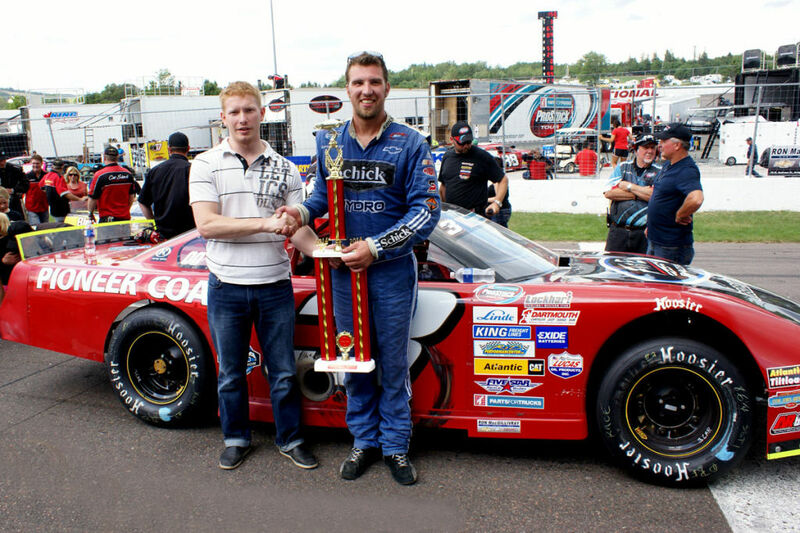 JAMES RIVER, NS – J.R. Fitzpatrick absolutely and completely dominated the Ron MacGillivray Chev Buick GMC 150 at Riverside International Speedway on Sunday afternoon in capturing his first win, in his first start, on the Parts for Trucks Pro Stock Tour (PST). Fitzpatrick, a driver on the NASCAR Canadian Tire Series (NCATS) from Appin, Ontario, took the lead from polesitter John Flemming on lap one and held off all challengers on each and every restart en route to the victory. The win gives a weekend sweep to Antigonish’s Nova Racing after hometown hero Donald Chisholm won the NCATS Wilson Equipment 300 at Riverside on Saturday. Chisholm finished third on Sunday behind Truro’s Dylan Blenkhorn. Jonathan Hicken (Brudenell, PE) and Cole Butcher (Porter’s Lake) rounded out the top five. At one point in the event, just past the 100-lap mark, it looked like Nova Racing might take home a 1-2-3 finish with their third ‘horse’ George Koszkulics (New Glasgow) blazing through the field after spinning early to get as high as second with Chisholm in third; the podium sweep was doomed after Koszkulics was pinched into the front stretch concrete retaining wall while racing with another competitor. The race saw seven caution periods. Point leader John Flemming had electrical problems that resulted in a 19th-place finish, Second-place point man Shawn Tucker (Fredericton, NB) was involved in hard wreck late in the race, and was scored with a 17th-place finish. Blenkhorn made up ground on the points and now sits just 16 markers behind Tucker and 42 behind Flemming. 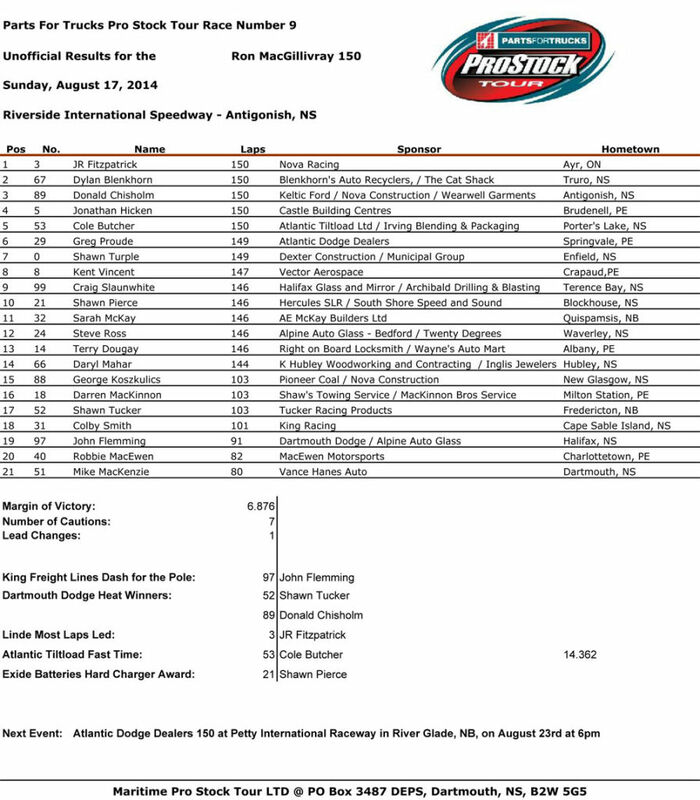 Butcher won the pro stock Atlantic Tiltload time trials and Flemming won the King Freight Lines Dash for the fastest six cars, giving him the pole for the Ron MacGillivray 150. Chisholm and Tucker won the Dartmouth Dodge heat races. Shawn Pierce won the Exide Batteries Hard Charger Award with his 10th-place finish after starting 21st. Fitzpatrick was a late entry in the event and took over the wheel after fellow NCATS Jason Hathaway was unable to rearrange travel plans after the event was postponed from Friday due to rain; since Fitzpatrick was already scheduled to stay to run the Highland Building Centres 100 for the Napa Sportsman Series he jumped at the chance to drive the pro stock as well. His sportsman race didn’t go as well with a DNF after the car overheated. Cape Sable Island’s Colby Smith won the sportsman feature leading 59 of the 100 circuits. Dale Richardson (Stellarton), the polesitter, finished second, and Phillip Barkhouse Jr. (Hammonds Plains) was third. The Parts for Trucks Pro Stock heads for Petty International Raceway near Moncton for the Atlantic Dodge Dealers 150, part of the 50th anniversary of the oldest stock car event in Canada – the River Glade International. The Napa Sportsman Series resumes August 30 at Cape Breton Miner’s Memorial Speedway in Sydney. Riverside International Speedway is back in action September 6 for its season finale, the Lucas Oil 150 – round 11 of 12 in the PST Chase for Championship. The Parts for Trucks Pro Stock Tour (PST) is considered the highest level of stock car racing in Canada. The Tour is recognized in the industry as one of the healthiest stock car racing series in North America. PST visits five tracks throughout the Maritimes during its May through September season. The Parts for Trucks Pro Stock Tour is owned and operated by Maritime Pro Stock Tour Limited. For more information, call our administration office at 902.481.2531 or click www.maritimeprostocktour.com.